i. A highly interconnected street network, dispersing traffic and providing convenient routes for pedestrians and bicyclists. ii. High-quality public spaces, with all building facades having windows and doors facing tree-lined streets, plazas, squares, or neighborhood parks. iii. Compact development, creating a walkable urban environment and conserving land and energy through reduced automobile usage and advanced techniques such as stormwater infiltration. iv. Diversity not homogeneity, with a variety of building types, street types, open spaces, and land uses providing for people of all ages and every form of mobility. v. Resilient and sustainable neighborhoods, adaptable over time to improved public transit and to changing economic conditions. PROCESS FOR REQUESTING THE NEW PMI DISTRICT: The new district provides form-based regulations that can be used to seek approval of a development concept plan formulated during a charrette-based planning process. This planning process would be a prerequisite for petitioning for this district. i. MIXED-USE CENTERS: On land designated on the Future Land Use Map as Village I Center, Village II Center, Community Center, or Regional Center. Land designated as Major Employment Center also qualifies provided the Major Employment Center fronts on an arterial street. ii. REDEVELOPMENT CORRIDORS: Land designated commercial on the Future Land Use Map that front on US 41 from the southern edge of the City of Sarasota to Jacaranda Boulevard; on Bee Ridge Road from US 41 to Interstate 75; or on Stickney Point Road from the Intracoastal Waterway to Swift Road and on Clark Road from Swift Road to Interstate 75.
iii. Land designated commercial on the Future Land Use Map, provided it is located within a designated Village Center or Town Center on the Future Land Use Map. Final version as adopted by the Board of County Commissioners on August 28, 2007. 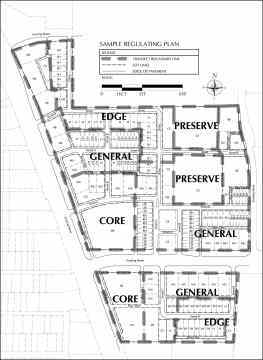 May 9, 2007, draft for Planning Commission public hearing on May 9. Click here to go to Sarasota County's form-based codes web page. 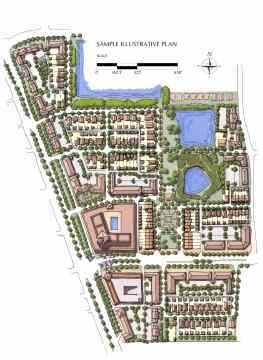 This code was prepared for the Sarasota County Board of Commissioners by Dover, Kohl & Partners and Spikowski Planning Associates.